Home Costs > How Much Do Roof Trusses Cost? How Much Do Roof Trusses Cost? Roof trusses can be made of timber or steel and are formed together to support the weight of the roof. The most common and oldest type of truss is the king post truss, which is in the shape of a triangle. The horizontal piece along the bottom is known as the tie beam, and the vertical piece through the middle is known as the king post. 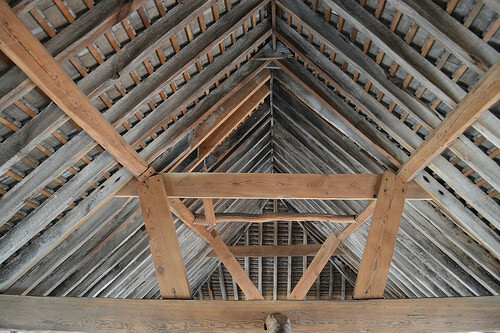 The sides are called the rafters, and the middle pieces are referred to as the struts. There are also other types of roof trusses that can create different shaped roofs. Some of these may include the queen post, arch-braced, hammerbeam, and scissor styles. The cost of a roof truss will depend on the design, the lumber being used, size, roof pitch and other variables we talk about below. Since so many variables need to be considered, it can be hard to give an exact cost. The truss alone, without any installation or delivery, can cost anywhere from $35 to $150 each, or if you want to price it by the foot, it can be anywhere between $2 to $5 per foot when using economical lumber. However, in some cases, the more you purchase at once, the more you can save. Now, if you want to factor in the professional labor fees, the total costs can be about $4.50 to $6 per square foot. This would include the labor, equipment needed to install and the lumber required to create the roof trusses. Since each job can be so different, consider getting multiple quotes for free at HomeAdvisor.com. Here, you can simply explain your job and licensed, reputable contractors will contact you with bids. Timberlake Trussworks, LLC, for example, created a very informative cost guide. According to their costs, the average cost of a truss can be anywhere between $81 to $104 per truss. As a total quick truss estimate for a simple house, then the costs will be very close to $2,000 for just the materials. This wouldn’t include the labor or machinery for installation. This RoofCalc.org roof trusses cost calculator helps you estimate how much you may need to budget. As mentioned, the more trusses you purchase at once, the more you can save. For a professional, it will just as easy to create 10 trusses when compared to just one. The truss will only be able to hold only so much weight, but in some cases, it may need to hold more weight than average. If this were the case, then the design will need to be different. For example, if you were to switch from a standard gable end truss to a scissor truss, then the costs could increase 20 percent. As discussed below, there are two types of materials: timber or steel. Wood will always be cheaper than steel. The steeper the roof will be, the more it will be since the boards will need to increase in size as the roof area increases. As a standard, the average truss will be spaced two feet across, making the roof ready for the average roofing job. Again, almost all trusses will use this as a standard; however, in some cases, Timberlake Trussworks, LLC says some customers may ask for trusses every 16 inches to create a stronger roof. In barn or shop situations, the spacing can be as far apart as eight to 10 feet. The span is defined as the length at the bottom, and all trusses won’t be created the same. If the span is 26 feet, for instance, then the bottom cord can be built using a 16-foot and 10-foot piece of lumber, leaving no scrap behind. However, if the truss needs to be customized and scrap is left over, then the costs could increase. On the market, these are the most common truss designs you will see: the scissor truss, raised heel, hip, girder, mono, gambrel, polynesian, bowstring and tri bearing. As for the ceiling style, popular types may include cathedral, vaulted, studio vault, inverted, tray, barrel vaulted or flat. Trusses, on average, will be made from timber (wood), but in some cases, it may be made from steel as well. Trusses are sold by major nationwide stores such as Home Depot, Lowe’s, Menards and Ace Hardware. What are the extra costs? The estimates mentioned above will not include the delivery and/or additional taxes. Taxes, depending on where you live, can add another 5 to 10 percent to the total, while delivery, as long as within 20 to 30 miles, can be another few hundred dollars. Upgrading the grade of lumber can increase the costs. How can I save money? The more you purchase at once, the more you can be able to save. From what we have researched, buying more than 10 to 15 at a time can help you save up to 15 percent. Advertising Disclosure: This content may include referral links. Please read our disclosure policy for more info. How much did you spend? The information contained on this website is intended as an educational aid only and is not intended as medical and/or legal advice.